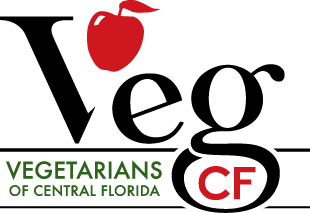 Vegetarians of Central Florida (VegCF) is a social and educational group for vegetarians and vegans and those aspiring to be in the Central Florida area. See About Us for more info about VegCF. The VegCF Meetup group is the primary way for members to be informed about and RSVP for VegCF events. VegCF has over 5,000 members on Meetup! 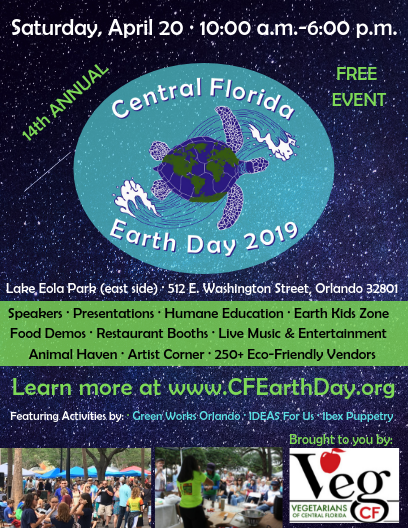 VegCF will present the 14th annual ﻿Central Florida Earth Day﻿ at Lake Eola Park on April 20, 2019. The event is the largest Earth Day festival in Florida and the largest vegan festival in the country! Please RSVP on the Earth Day Facebook event page and join the Earth Day Facebook community page. VegCF presented the 13th annual Central Florida Veg Fest at Orlando Festival Park on Saturday, October 27, 2018. The event is one of the biggest and best vegetarian festivals in the country! Please join the Veg Fest Facebook community page. ​With our two annual festivals, VegCF directly reaches more people with a positive vegan message than any other place in the country! Classic Veg Fest and Earth Day t-shirts/bags are available for sale at Market on South. ​If you are a local veg-friendly restaurant who would like to promote yourself, please check out the Advertising Programs page. Vegan Victory Team is a group for vegan athletes in and near Central Florida to share information and organize teams for mud runs, triathlons, adventure races, trail runs, runs, and other athletic events. Members must be vegan and experienced with or interested in participating in these kinds of events in and near Central Florida. We invite you to join the Central Florida Vegan Professional Database, sponsored by Vegetarians of Central Florida. If you are a vegan or vegetarian business owner in Central Florida, please use this group to post advertisements for your business. If you are a veg*n consumer, you can search for the services you are looking for.